Qobuz, (pronounced CO-buzz) the world's only true Hi-Res Audio streaming and download service, announced today that it will premiere its service live at the upcoming CEDIA Expo, September 4-7, in San Diego. Qobuz will be live at CEDIA Expo in the San Diego Convention Center, San Diego, CA, September 4-7, 2018 in booth 4047. Qobuz offers an extensive catalog, including hard-to-find jazz and classical albums and tracks. Dwarfing other providers, Qobuz will offer by far the largest catalog of streaming Hi-Res audio (24-bit, up to 192k) in the world. Qobuz works on Mac, iOS, Android, and Windows on both mobile and desktop and will be integrated with all of the most prestigious Hi-Fi brands. "We are excited to give industry professionals the opportunity to experience firsthand the amazing quality across all genres that our extraordinary music service offers," said Dan Mackta, Managing Director of Qobuz USA. "Qobuz offers streaming to your phone or computer in standard FLAC files, so no special hardware is needed for the highest resolutions. In addition to its vast collection of pristine 24-bit audio, Qobuz offers exclusive editorial content that fosters in-depth listening and fan experience with hundreds of thousands of album reviews, interviews, biographical articles, digital booklets, photographs, artwork and a sophisticated recommendation and curation component. "We'll be showing a sample of partner equipment in our booth, including Sonos, DCS and Naim. Other partners, such as Anthem and Paradigm will be playing Qobuz exclusively in their dedicated sound rooms, where the best sound quality is paramount," said David Solomon, Chief hi-res music evangelist. About Qobuz Founded in 2007, Qobuz is a Paris-based commercial online music streaming and download service that addresses the needs of curious and discerning music lovers across the globe as the only true Hi-Res Audio streaming service. Complementing its unparalleled sound quality, Qobuz includes an exceptional range of music genres as well as exclusive editorial content. 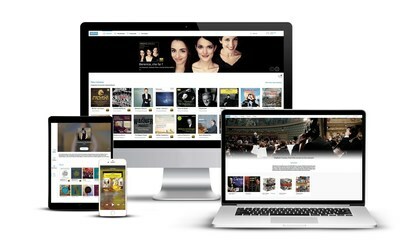 Qobuz offers subscription to streaming services with CD quality and Hi-Res audio spanning all genres. The service also offers the largest catalogue of 24-bit Hi-Res albums for download.